The 3M� DBI-SALA� Tape Measure Sleeve conforms to the size of virtually any tape measure and allows your tool to be safely tethered while working at height. The sleeve is constructed from a heavy-duty neoprene material and is designed to be used with our Tape Measure Retractor Holster (sold separately), or on its own using a belt clip on the back of the sleeve. A belt clip on the back of the sleeve allows the sleeve to be holstered quickly. A D-ring on the sleeve allows the user to tie off their tape measure. 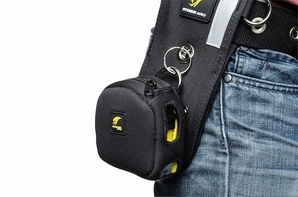 The Tape Measure Sleeve is designed to easily be used with our Tape Measure Holster. A clip on the back of the sleeve can be used to clip to a belt or a Tape Measure Holster.